Summary TAKE OFF is a Malayalam language drama, set in 2014, in which a group of Indian nurses are stranded in Iraq as the country descends into chaos. 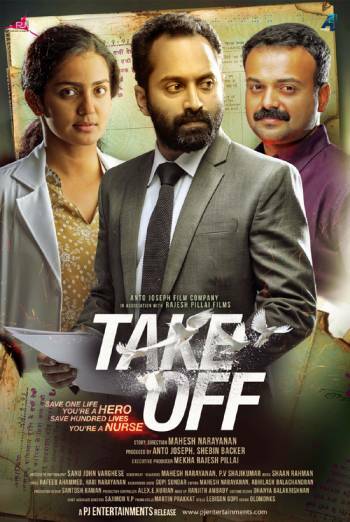 TAKE OFF is a Malayalam language drama, set in 2014, in which a group of Indian nurses are stranded in Iraq as the country descends into chaos. Violence includes shootings and explosions. There are scenes in which characters are held prisoner at gunpoint, manhandled by terrorists, or shelter from explosions. In one sequence a group of men are blindfolded, bound, and made to kneel before a grave. Scenes depict medical staff treating injuries, including bloodied bodies and brief injury detail but no graphic imagery. References are made to pregnancies and abortion.